My poor neglected blog! I’ve been so busy and this blog isn’t as important to me as it used to be. I am doing well, better than I have for a long time actually. I have an autoimmune disease that has had me on my knees (metaphorically speaking) for a few years now. While I was very sick, my blog became my happy place where I could pretend everything was fine, and channeling my time and attention into that online reality served its purpose well for me when I was too weak or sick to do much else. I am much improved these days, but it takes a lot of work and a lot of time to keep myself that way, and this does greatly limit my ability to do other things. Worth it, though, so worth it. I still find time to sew (of course!!) and so here is a dress that I did show on Instagram but have never blogged. It is one of my favorite things I’ve made to date – a basic four darted bodice block with boat neck, low back and full circle skirt. I used a lovely cotton lace from Spotlight that I’ve had for a couple of years in the most perfect navy and underlined it in a buttery soft while cotton voile. To get the back neckline to fit closely against my back without gaping, I used a simple trick that works very well for this purpose – stabilizing along the seam allowance with twill tape, easing it slightly with lots of pins before sewing a line of stay stitching. I probably cut the twill tape about an inch shorter than the neckline and eased in the back bodice to fit the twill tape. After sewing, I steamed it to ensure no wrinkles and a smooth line. I cannot emphasize how important steam and a good press is to your finished result. To give extra support to the neckline, I also used a lightly interfaced facing, which I understitched and then invisibly blind stitched to the underlining. After all that the neckline hugs my back like a dream and I can be confident it won’t stretch out with wear despite being cut on the bias. My zipper I hand stitched using a pick stitch, which rendered the zipper basically invisible, and more secure than an invisible zip, which would have been difficult to sew with the thick lace. The sleeves I used my tried and true sleeve, which started life as a Collette Peony sleeve but has been modified so dramatically I could probably claim it to be “self-drafted”. It has a very pronounced forward sleeve adjustment and fits my shoulder socket perfectly. I also find using three lines of gathering stitches at the sleeve head gives more control and sleeve that sets easier than if just using the standard two lines of gathering stitches. I researched petticoats/crinolines for Australia and found my best option was a “Vintage Demure“petticoat, from http://petticoatsdancefashion.com.au. The 55cm length was perfect for my knee length skirt, its soft and beautiful quality with just the right amount of fullness without feeling costumey. Of course, pockets had to be added, and I just love how pockets give me somewhere to put my tissues, random child-found objects and somewhere to nonchalantly to put my hands. 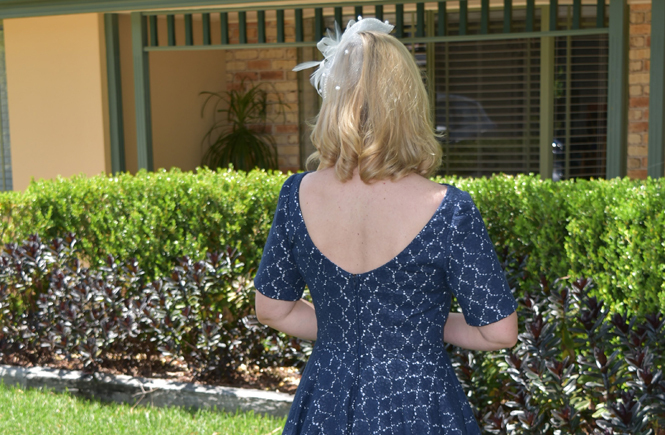 Pattern: My own, but I recommend you start with a basic darted and sleeved bodice like the Emery Dress, and add a circle skirt and pockets and scoop out the back neckline to your liking. A closer pattern with a v back neck is Vogue 8615 (now OOP) but would work perfectly for this style. Made For: Lesley’s Wedding November 2016.